The T-90MS main battle tank from Russia. The Indian government has approved a proposed plan to procure 464 units of Russian-made T-90MS main battle tanks for the Indian Army, which is expected to cost around INR134.48 billion (US$1.93 billion). These tanks are expected to be deployed to armored units near the border with arch-rival Pakistan. A contract between the Indian Ministry of Defence (MoD) and Russia’s Rosoboronexport is expected to be signed within the year, and may include “Make In India” clauses allowing production of certain parts, and assembly of imported kits from Russia’s Uralvagonzavod to be made in India’s Heavy Vehicles Factory (HVF) in Avadi near Chennai. 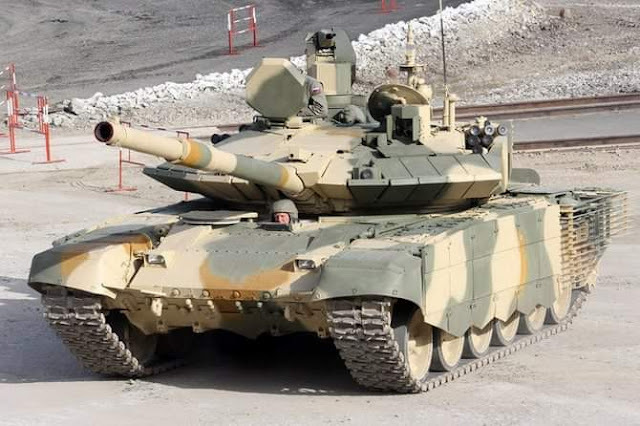 The Indian Army already has 18 regiments equipped with the T-90S “Bhishma” tanks, all are deployed opposite Pakistan. The purchase of 464 more units will add 10 more regiments.